Chatree. A Greenfields Discovery in Thailand. M.G. Diemar. CHATREE. A GREENFIELDS DISCOVERY IN THAILAND. The discovery and definition of the Chatree gold deposits in Central Thailand resulted from the efforts of a small dedicated team over a long period of time backed by shareholders with unreasonable faith. Total official resources to date are 14.6 million tonnes at 2.7 g/t Au and 12 g/t Ag for 1.2 million ounces of gold, discovered and advanced through Definitive Feasibility for US$6 per ounce gold equivalent. Exploration commenced in the year of King Rama IXs, 60th birthday (1987) and continued throughout his 6th (12 year) cycle. Exploration costs were kept at an affordable level for a junior company by, keeping overheads low and by adopting a mixture of modern gold exploration concepts combined with traditional prospecting techniques, using only one part time expatriate to guide a team of Thai geologists and ensuring that drilling was carried out early, with genuine targets at a controllable rate. 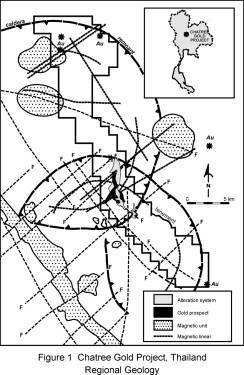 At Chatree gold occurs in an adularia-sericite epithermal system within quartz-calcite-adularia veins, breccias and stockworks in a host intermediate volcanic arc sequence of Triassic age. The project is anticipated to be in construction during 2000. The art of being successful in Thailand is related as much to ones ability to think long term and to appreciate the country's culture, history and confucian business systems as to ones ability to find gold. Chatree is located on the eastern edge of the Tertiary Chao Phraya Basin in gently undulating farmland 280 km north of Bangkok, on the border of Petchabun and Pichit Provinces as shown on Figure 1. The project consists of five defined prospects (A,B,C,D and H) within an alteration area of 7.5km by 2.5km in gently undulating farmland. The prospects occur within a north-south trending Upper Permian and Triassic volcanic arc sequence formed above subduction associated with the collision of the South-East Asian and Shan-Thai crustal blocks. The volcanic belt contains low sulphidation epithermal gold, copper/gold skarn and porphyry copper occurrences. Hard rock mining of malachite and magnetite from skarn has taken place in a number of locations in this belt over the last 4000 years dominantly during the bronze and iron ages. Minor alluvial gold has been produced at the village level in the northern half of the belt, mainly within Lao PDR. Chatree is a greenfields gold discovery however we recently became aware of local folk-law describing minor colluvial and alluvial gold workings by slaves of the Japanese during World War 2 and by unknown parties during the reign of King Rama IV about 100 years ago in areas approximately 10 km south and 10 km east of Chatree. PERIOD OF UNBRIDLED ENTHUSIASM 1987-1988 Thailand was chosen as an exploration target in 1987 when foreigners were, for the first time, allowed to explore for gold. Good regional logistics in this very stable country with a mature mining law and reasonable gold and copper prospectivity were the determining factors in attracting the company. Exploration commenced pre-crash in 1987 by Epoch Mining NL in joint venture with Kulim Limited and a private Australian partner. In late 1987 the writer rejuvenated the almost defunct joint venture and with the in-country help of Robin McQueen an Australian expatriate, set up a simple corporate structure, (Thai Goldfields Limited), an office and a team of one senior and five junior Thai geologists in Chiangmai. Initial work included visits to every gold occurrence known to the Department of Mineral Resources (DMR) and every location having gold in its name, recorded the Thai 50,000 topographic sheets, of which there were large numbers. eg Gold Nugget Creek, Village of Gold Pits etc. This was a worthless exercise as most hardrock gold were minor skarn styles and the alluvial occurrences could not be related to hardrock sources. In addition it was concluded that alluvial gold should be the province of the local villagers and known hardrock occurrences generally had associated "difficulties". 1. About 30% of Thailand required exploring. 2. No modern gold exploration had taken place and Thai geologists were only familiar with quartz vein and skarn styles. 3. The joint venture had limited funds. 4. The ability to raise further funding was diminishing. 5. In-country gold assays were unreliable and >US$35 per sample. 6. There was no competition for ground so it was possible to explore without title. 7. The writer would run Epoch Mining NL and the joint venture from Australia and commute to the field regularly to train Thai staff and to vet past work and plan forward programs. 8. All work would be carried out in a low key manner. Classical style exploration of this large area was clearly not possible and multiple field teams were organised to carry out rapid reconnaissance prospecting over large areas of the main gold belts including slate belt vein styles in the west, disseminated gold arsenic antimony in Prae-Lampang, gold-barite associations on the peninsular, in Mae Hong Son and Loei and epithermal/skarn/porphyry Cu models in the far north, in Loei and in the Petchabun Belt. The tools used were regional geology, definition of metallogenic belts, mineralisation models, rapid reconnaissance mapping, panning of soils above break-of-slope and alteration mapping. Panning was considered a suitable technique for reconnaissance gold geochemistry in these South-East Asian terrains (latitude ±16 degrees north) where laterisation resulting from the dry monsoonal climate was predicted to have resulted in pannable sized gold grains being developed overlying even fine grained epithermal styles. About 5 man years of field work was completed in this period which defined a very large number of targets. Pannable gold was first noted at 1508 Prospect at Khao Mo (now A Prospect of Chatree) and from many other similar hills in the Chatree district by a Thai Goldfields Limited team, including Khun Chatree, in July and August 1988 during a prospecting sweep utilising soil panning above break of slope as the primary exploration tool. 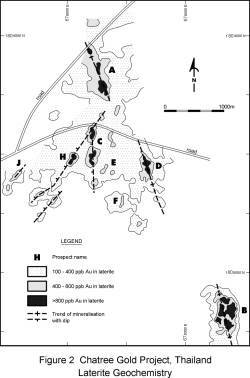 The potential at 1508 as a significant epithermal gold prospect was recognised by the writer in September 1988, during a periodic screening and prioritising of all new Thai Goldfields' targets, with recognition of epithermal textures including crustiform veining and hydrothermal breccias. The following policies were formulated at this time, which brought the main reconnaissance phase to a close. 1. Delete the following areas from the "potential targets" map. Mountainous (watershed, erosion) areas, some categories of forestry reserves, all national parks and many other reserve categories, heavily populated areas, areas within 10 km of known provincial strong men, military areas (past, present and future), large areas of farmland with ill-defined land title, later to be designated Sop Or Kor, areas with elephantitus, and a number of other uncategorised areas. 2. Concentrate on epithermal styles in the Loei and Petchabun belts as they have the best metallurgical, environmental and logistical factors associated with them. 3. Focus on a small number of the best targets and try to make a success of them. Prospect 1508 was chosen as the highest priority target and in the ensuing period received about 60% of the exploration effort. It was a hill 110 metres high and 950 metres long trending at 005 degrees. Detailed grid based C horizon hand auger geochemistry, float sampling and later 800 metres of hand dug trenching were undertaken which outlined a strongly gold anomalous zone in soil and bedrock at greater than 0.5 ppm Au over a width of 150 metres and a length of 1300 metres trending at 350 degrees, the regional structural direction. The trenching to bedrock confirmed the C horizon geochemistry with results as follows. Many of the trenches stopped in mineralisation. Limited regional auger geochemistry on short east-west lines, north and south of 1508, was largely unsuccessful. Regional prospecting and exploration in this and other districts, mainly on a series of epithermal targets was carried out with reasonable results. The success at 1508 coincided with a difficult financial period for the joint venture. The following conclusions were arrived at which brought this productive period to a close. 1. It would be necessary to obtain stronger title to the prospect before further serious work could be justified. 2. It would be desirable to bring in a partner, preferably Thai, to support the project. A limited field program was maintained initially, but a serious lack of available funds and to a lesser extent, a lack of confidence by some, in our ability to gain strong mineral title to the project, led to a suspension of field work and eventually to a disbanding of the Thai Goldfields technical team. The administration side of the company continued to pursue title and maintain assets while partners were sought. The company's name was changed to Issara Mining Limited to lower our profile. Over a period of 18 months, major Australian, Canadian, French and Dutch groups come close to joint venturing the properties but failed to commit. Epoch Mining NL withdrew from the exploration scene and in mid 1993, its Thai interests were sold to Kingsgate Consolidated NL. The writer went with the properties. Efforts were directed to finding a Thai partner and in late 1993 a letter of intent was signed with Ban Pu Co., Ltd giving them a 51 % participating interest in the 1508 project and a joint venture company Akara Mining Limited was formed. Special Prospecting Licences (SPLs) were applied for by the joint venture over 1508 and its potential extensions. In 1994 the DMR formulated a policy to cancel all of the applications and to create reserves over the district for the purpose of tendering to exploration companies. This led to a 12 month period of uncertainty until the policy was dropped. In June 1995, the SPLs were granted and exploration by the writer and Ban Pu staff commenced. No flashes of wisdom appeared at this time; it was just a relief to be busy. PERIOD OF SUCCESS 1995-1999 Subtitle – False dawn. July, 1995 to August 1996. Exploration commenced in July, 1995, at the beginning of the heaviest wet season in Thailand for 10 years. The program included RAB bedrock drilling at 1508A Prospect (previously 1508 Prospect) and 1508B Prospect (discovered by the DMR in about 1992/3, 5 km south-east of 1508A Prospect). A number of encouraging intersections were recorded. The centrepiece of the program was a 14 hole diamond drill program on 1508A Prospect with 4-5 holes on each of 3 lines, 200 metres apart, across the geochemical anomaly, which resulted in the following interesting, but to the joint venture, basically disappointing intersections. 1.2 m @ 51.00 g/t Au & 70.0 g/t Ag Remember - hopes were high. Due to the inconclusive nature of the results, there was an hiatus in the program while further budgets were argued and approved and fieldwork was only recommenced when the heat had built sufficiently, late in the dry season. During this inactive period, Kingsgate's equity in the project was increased from 31.6% to 90% as described below. Following orientation sampling, a regional grid based auger laterite sampling program was completed over the pervasive silica alteration system. Laterite samples were taken to avoid surface contamination from gold bearing silicified volcanic material derived from local quarries and used on provincial and farm roads. Strongly gold anomalous zones of a similar tenor and size to that existing at 1508A were defined in very gently sloping country between 1508A and 1508B Prospects as shown on Figure 2. As the monsoon approached and the anomalous areas were being prepared by farmers for corn planting, a hurried bedrock RAB program was completed to determine if the laterite anomalism extended into the bedrock in a meaningful way. Subtitle – Success at last. July, 1996 to present. 9.0m @ 3.84 g/t Au. 6.0m @ 5.32 g/t Au. This zone is now designated PROSPECT 1508D." The receipt of these results for C and D Prospects, represent the defining moment of the Chatree Project. Work completed to date on C and D Prospects and later H Prospect has included: 498 RC, DDH and combination RC/DDH holes for 38,759 metres of which 23, 317 metres were core. Drill sites were generated by targetting the 0.8 ppm Au in laterite contour until the mineralisation was outlined then infilling to generally 25 x 20 m spacing for resource definition. 107 trenches for 5,708 metres were completed at the end for resource sampling purposes. 10 fully cored geotechnical holes were completed. 3 full size water production holes were completed. 35 sterilisation RC holes for 1,525 metres were completed. The Busang fiasco and a long stockmarket and gold price decline resulted in increased project expenditures to ensure the highest quality of all project and testwork data. Independent pre-feasibility, interim feasibility, definitive feasibility and Environmental Impact Assessment studies were completed. This work has led to the definition of viable gold reserves located within a structurally controlled quartz, carbonate, adularia epithermal system, able to be mined by open cut methods with gold extraction in a standard CIL plant. Mining Lease applications are proceeding well with the Environmental Impact Statement being the last document requiring approval. Construction is anticipated to be commenced in early to mid 2000. RESOURCE GROWTH C, H and D Prospects. The following formal resource estimates show the steady growth in resources in C, D and H prospects, and reflect the success of the field programs. The other prospects have not advanced to resource status yet due to lack of drill density. MINEABLE RESOURCE/RESERVE GROWTH C, H and D Prospects only. The pre-feasibility and interim feasibility studies were based on mineable resources as the Whittle runs included Inferred Resources. The Definitive Feasibility was based on correctly derived reserves which resulted in slightly lower contained ounces because Inferred Resources were not included and a gold price of US$260 was used rather than US$275 as in the Interim-feasibility..
PROJECT PARAMETERS C, H and D Prospects only. Project Parameters - Definitive Feasibility Study. C, H and D Prospects only. The project will be one of the lowest cost producers in the world. The self explanatory calendar of equity involvement of the company that the writer represented varied through time as follows. Shares in Thai entity issued to Thai staff. Kingsgate purchased equity of Australian partner. LESSONS LEARNT (which apply to the small company approach). If you believe in a project fight for it. Always show your strong intent. Be single minded. Patience is not a virtue it is a survival mechanism. Speed kills. The shortest distance between two points is not a straight line. Learn to recognise if you have a problem. Learn to identify the problem. Deal with the problem immediately. Never take you eye off the ball or it will disappear. Use trusted national staff in all dealings with nationals. Budget size often has an inverse relationship to success as time kills the enthusiasm of backers. Develop a wide network of national information contacts (spies). Maintain a very low profile. Equity is king. Technical excellence is essential in prospecting and exploring. (something geological at last) Above all things, remember you are a guest in the country. The Chatree Gold Project has strong simple technical and financial fundamentals which when combined with the enormous potential for further discovery in the immediate surrounds will ensure a very long life for this new goldfield for which all of those people who have contributed to its discovery and definition can be justly proud. I wish to acknowledge the contribution to the Chatree Gold Project of Surapol Udompornwirat, Suphanit Suphananthi, Pornthep Suwannachote, Abhisit Salam, Thibdee Sookhook, Kitipong Kongsawast, Mike Garman, Charnwit Premgamone, Aroonwadee Smarnmit, Chatree Chaicanapoonpol, Surapol Pikraungan, Sirinya Ponsonda, Chamrat Sangsrichan, Nopadon Chinabutr, those unnamable souls and those many people involved in the feasibility and other studies. .